Gender stereotyping in advertisements is a common tactic used for many brands and products to portray their target audience. Whether it’s the strong, luxurious shampoo that only features women with beautiful, long hair in their commercials or the newest camping gear that only shows a male on the packaging. Brands are consciously choosing to highlight and promote to one gender over the other. Are consumers aware of these gender stereotypes in advertising? Do they like having products for one gender over the other? Should the advertising industry even contribute to gender stereotyping? We set out to better understand how the average consumers perceive gender targeting and gender stereotypes in advertising with our recent Gender Stereotype Survey. We wanted to learn how attuned they are to the role gender plays in ads and how they’re affected, whether they appreciate when brands break gender stereotypes, and what aspect of an ad they think promotes these stereotypes. Finally, we questioned whether these consumers believed the ad industry should be held responsible for breaking or reinforcing gender stereotypes. Using the SurveyMonkey audience panel, we surveyed 500 consumers, specifically, 250 men and 250 women. To gather data from a broad cross-section of the American public, our respondent pool represented a range of ages 18 and older, are located in every region of the U.S. and have household incomes ranging from $0 to $200,000+. At the beginning of the survey, we provided a brief definition of the term gender stereotype with traditional examples for both men and women. Throughout the survey, we tackled a variety of different subjects including brand breaking stereotypes, creative design and the copy of ads pushing stereotypes, purchasing behaviors, and the ad industry’s role in breaking stereotypes. While there is an audience that will react positively to brands actively breaking gender stereotypes, there is an even bigger segment of consumers who will not be affected. 44% of respondents said when it comes to their feelings about a brand, they are not impacted by advertisements that aim to break stereotypes. 50% of males are more likely to experience no impact from a brand trying to break a stereotype compared to 38% of women. 25% said they are more likely to purchase from that brand. Does something as simple as the font and color treatment of an advertisement impact consumers’ perception of it? Yes, but not in the way one might expect. 43% of respondents thought it was targeting men. However, when provided more information on the font and colors of the men’s ad tagline, respondents had mixed opinions on who the ad was targeting. 189 people responded both men and women, while only 112 responded men. Colors, fonts, images, words, and phrasing create a connection between the creative aspects themselves and the reinforcement of gender stereotypes. 60% of survey respondents agreed that colors and fonts in ads promote certain gender stereotypes. 80% of respondents agreed that images in an ad promote gender stereotypes. 75% agree words and phrasing in ads can also play a part in promoting a certain stereotype. Opinions are mixed on whether gender stereotypes affect purchasing behavior. There is a notable segment of consumers that will sometimes buy men’s products and sometimes buy women’s products, regardless of their gender. 42% of respondents stated that they sometimes prefer products made for a different gender than their own. However, there are also segments, 39% of respondents, that will only buy products for their own gender and will never buy those made for a gender different than their own. Perhaps unsurprisingly, men are less likely to buy women’s products than women are to buy men’s products. Respondents opinions are mixed on whether the ad industry should be held responsible for breaking gender stereotypes. However, more than a third of respondents don’t feel either way strongly. 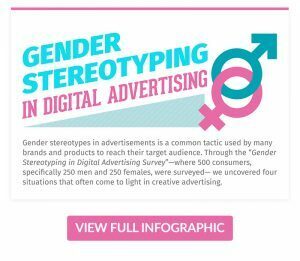 The survey revealed many things regarding the use of gender stereotypes in digital advertising. While some people don’t mind the gender stereotyping that can be formed through an advertisement and actually prefer buying products for their gender, there are others who believe it is important to start breaking these stereotypes and would actually prefer buying from a brand which is more progressive and forward thinking of products as they relate to genders. Based on what the survey revealed it’s important for advertisers to take into consideration what the product is and if it could be used for male and/or female. As some women shared, they often prefer buying products that advertise towards women, if they work. However, many products could be used for either male or female. If an advertiser is producing ads for a product that could be utilized for either gender, they should consider a message and creative style that appeals to both without portraying that it really should be just for females or just for males. Stay tuned in the coming weeks to take a deeper dive into Brands Breaking Gender Stereotypes with Digital Advertising, Does Creative Design & Copy Push Stereotypes?, How Does Digital Advertising Influence Purchase Behaviors?, What is the Ad Industry’s Role in Breaking Stereotypes?.